This is an exceptionally well kept and updated Estate Home located on the golf course in Heritage Bay Golf & Country Club. 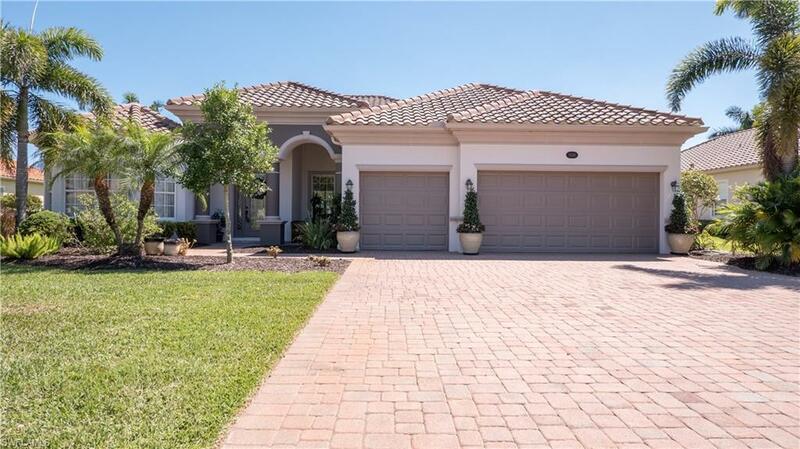 The popular Sawgrass floor plan offers 4 bedrooms plus den, 3 baths, 3 car garage, pool and spa with huge lanai for entertaining. This home is beautiful and decorator touches are everywhere including lighting, fans and fixtures. New appliances have been recently installed. All of the closets, in addition to the pantry and storage closets, are built out with custom shelving. The golf course and lake views offer privacy and entertainment. Heritage Bay offers 27 holes of Championship golf, clubhouse with fine and casual dining, fitness center, tennis, pickle ball and lots of activities. Copyright 2019 Multiple Listing Service of Greater Fort Myers and the Beach, Inc.; All rights reserved. The data relating to real estate for sale on this web site is the copyrighted and proprietary database of the Multiple Listing Service of Greater Fort Myers and the Beach, Inc. The properties displayed may not be all of the properties in the MLS\' database, or all of the properties listed with Brokers participating in the cooperative data exchange program. Properties listed by Brokers other than The Golf Course Experts are marked with BR logo and include the name of the listing Brokers. Information provided is thought to be reliable but is not guaranteed to be accurate; buyers are advised to verify facts before making the decision to purchase a property. No warranties, expressed or implied, are provided for the data herein, or for their use or interpretation by the user. Information provided is for consumer\'s personal, non-commercial use and may not be used for any purpose other than to identify prospective properties consumers may be interested in purchasing. This site will be monitored for \'scraping\' and any use of search facilities of data on the site other than by a consumer looking to purchase real estate, is prohibited. Listing broker has attempted to offer accurate data, but buyers are advised to confirm all items. Information last updated on 2019-04-20.